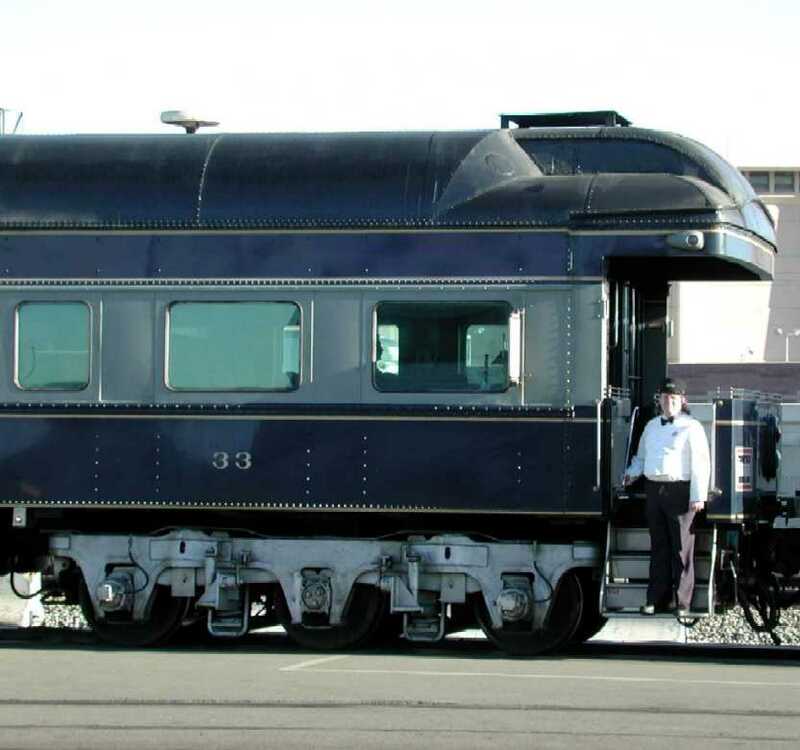 The Tamalpais was built by Pullman in 1923 for the Aitcheson, Topeka & Santa Fe as business car 33. It has its original oak interior and high ceilings. 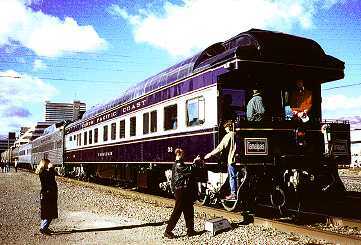 Business cars were used by railroad executives to travel behind passenger or freight trains to meet with and entertain the railroad's customers. They seldom left their home railroad unless being used by a politician giving stump campaign speeches from the open rear platform. Business cars are self-contained with a lounge, several bedrooms, a dining room, crew's quarters and a kitchen. Railroad president's always had male secretary's so they could travel with the boss and not raise eyebrows. The cars supplied their own heat and electricity when behind a freight train. Older business cars had a hidden compartment for booz (they were built during prohibition days). Ask to see the one on the Tamalpais. My boss in San Diego bought Minneapolis, St. Paul & Sault Ste. Marie Railroad business car #52 in 1960 -- used by Soo Line presidents. Ten years later (1970) a retired "$oo Line" (their logo) car man visited San Diego and asked to see the car. Onboard, in the master bedroom, he cocked a scounce lamp to the right and lifted a panel in the woodwork. A hidden compartment had old, corked bottles of Three Feathers bourbon. They had been there for many years -- my boss was flabbergasted. The booz is still there. I was in charge of car #52 for 15 years (probably 300 round trips). That is how I met John Baldwin nearly 30 years ago, an owner of car #33 (the Tamalpais). Not counting the bedrooms or the four chairs outside on the platform, the daytime capacity of the Tamalpais is 16. This is likely the way we will be boarding -- at the extreme rear of a long train -- from gravel. The silver streamline car in front of the Tamalpais is our Super Chief Pleasure Dome. Close-up of the back end of the Tamalpais. Note the curvy cables coming out of the two outer axle journals. These feed an anti-wheel slip mechanism in the air brake system. Railroads had ABS long before it was added to automobiles. The high Sierra's may or may not be snow-covered by November 14-16. 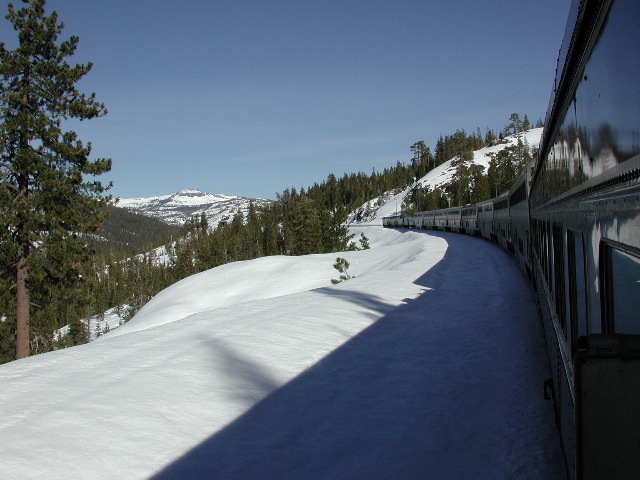 The route travels above Donner Pass with a nice view of Donner Lake. This shot was taken by someone hanging themselves out to the side of the rear open platform. Don't do this in a tunnel! In the lower right corner of the photo, note the dark, rectangular object. That is the back of a mirror. Instead of rear-view mirrors, these are front-view mirrors for people in the lounge. We can see the rear by just looking thru the back windows --these mirrors let us see what's ahead. Here is some background on the vintage railroad cars we will be riding. Heavyweight steel cars like the Tamalpais were made from 1910-1930 (few new cars were built during the Great Depression) . There were several car configurations, but the basic Pullman was the standard. Open berths, monitor roof, windows that opened, etc. In the 1930's, railroads started streamlining with new lightweight cars like the Plaza Santa Fe and Royal Gorge. Later many heavyweight cars were "modernized". The Tamalpais now has sealed windows and air conditioning (both likely added in the 1950's). In the second photo above look at the roofline near the end. This is the original monitor roof outline -- the center section was called a clerestory. The bulge which begins a couple of feet to the left is an add-on to handle the AC ducting. When built in 1923, the whole roof was clerestory outline with small stained-glass windows that opened for air circulation (and dust and cinders). Travelers wore dark clothes. Sad news for the Art Deco folks, but the USA went directly from old-fashioned to Streamline Moderne (skipping Deco) because of the Depression. Several Moderne train sets were made in the late 1930's, but WW2 stopped production for four years. From 1946 thru 1950, railroads made massive orders of lightweight cars. This was when the noted streamliners were built. Few new lightweight, streamline cars were built after 1952 as the airlines were taking over passenger transportation. In the late 1970's AMTRAK began adding new passenger cars -- none will be memorable.